Kathryn Cristaldi is a former children’s book editor. She is the author of Baseball Ballerina, Samantha the Snob, Even Steven and Odd Todd, and I'll Love You Till the Cows Come Home. She lives in New Jersey with her husband and daughter. Though there are no cows in her neighborhood, Kathryn has dressed up her dog in a cow costume on more than one occasion. 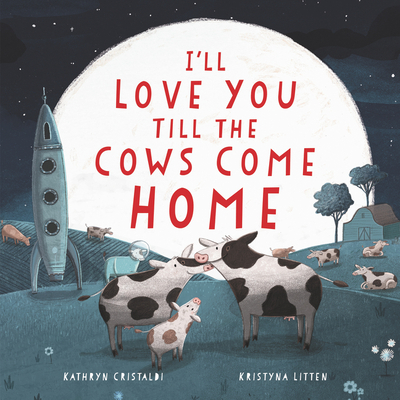 Kristyna Litten is a children’s book writer and illustrator. She has written and illustrated several books for children, including Chickens Can’t See in the Dark, as well as created artwork for book covers and magazines. She lives in Yorkshire, England. In a crowded genre, this zany title is out standing in its field—along with the cows. This rhyming narrative teaches children the comforting lesson that love is eternal… A cozy book with a message that is familiar to all and tailor-made for one-on-one sharing. This bedtime read-aloud is both hilarious and comforting.